Kanan experienced his first Easter this year and wore a festive bunny outfit too because he is so little he can get away with it. Of course Mike believes I tortured the kid in the same way the little boy in The Christmas Story was tortured by having to wear a bunny outfit. 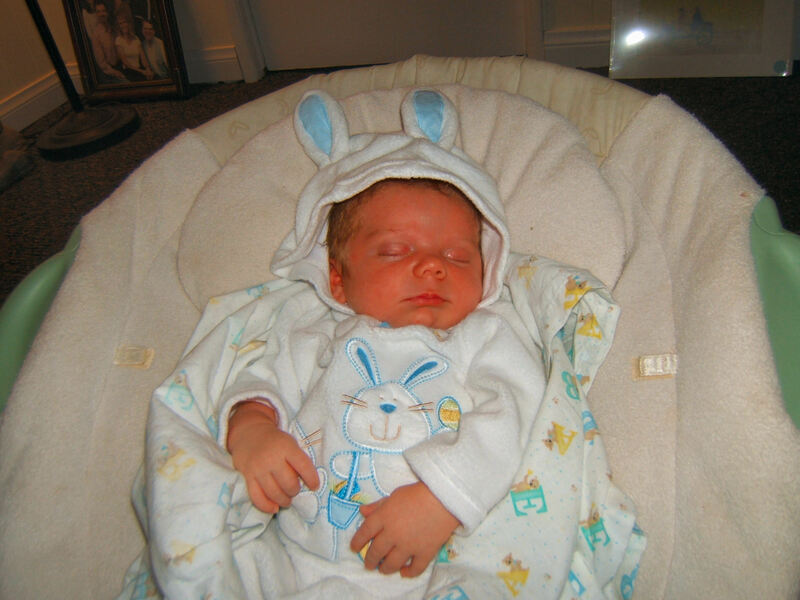 But in my opinion when you are one month old, you can get away with bunny outfits. Kanan slept through most of it as he was quite overwhelmed by all the attention he got in the hour or so that he was being sociable. Click HERE for pics of the family on that special day. Other than that, Kanan is 5 weeks old now and has reached two milestones this last week. One, he is starting to copy faces now. My sister Barbie helped us discover this last week when she came to visit. She would stick her tongue out—Kanan would stick his tongue out. She would make a fish face—he would make a fish face. He has done it a couple more times since then, when he is in the mood of course. And secondly, Kanan is smiling now!! He has given a genuine smile on a few occasians this week. One when he is rubbed in his silky blanket. Another when he sees his favorite stuffed animal while having his diaper changed. Its a cute black and white lamb that his great grandma and grandpa Hill got him in France. And lastly, this morning when I layed him down on his changing table and started talking to him in a high pitched baby-talk voice, he smiled at me and held it for a few seconds or so!! He went to my work today and visited with some of the teachers on campus whom have become my good friends. Everyone thought he was super cute of course and that he was a big baby. We even got a good lead for a babysitter and so I will be calling her soon to see if she has room for Kanan when I go back to work! « Kanan is 1 month old on Easter Sunday! Too cute!! I just love the outfit! Glad to hear that Kanan is smiling at voices. Isn’t it so cool? Xander started doing that last week and it melts our hearts every time.